After hiking most of the shoreline from Hanamaulu Bay to Anahola Bay it dawned on me that an interesting geologic feature that nearly escapes notice was a constant companion most the way. Though discontinuous in places, and often only visible at low tide, a naturally formed limestone shelf, a barrier between reef and shore, surrounds the island of Kaua‘i. 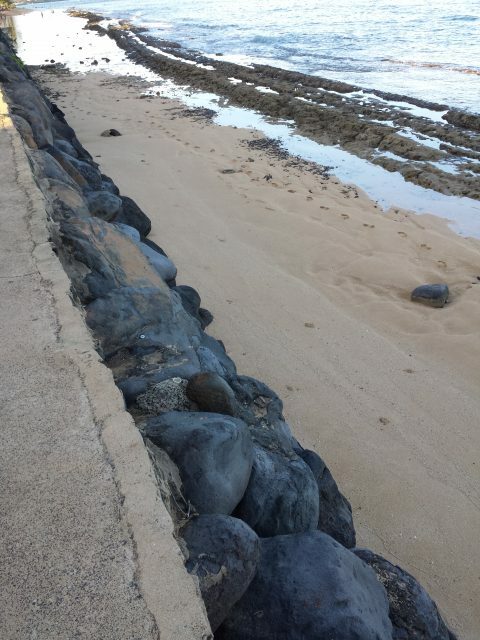 For commercial reasons, the shelf was obliterated at Hanamaulu Bay, to provide a sheltered harbor and pier at Ahukini Landing. By contrast, the limestone formation appears to extend forever northward from the south end of Nukoli‘i Beach. In reality, it vanishes briefly adjacent to the Wailua Municipal Golf Course, and is only visible intermittently near the mouth of Wailua River. “Baby” Beach exists because of the tidal trough between an extent of the limestone formation and the seawall along Moanakai Road In Kapa‘a Town. Google Maps calls this Fuji Beach, but everyone in town knows it’s Baby Beach. An appreciable portion of the limestone formation rings the second embayment north of Donkey beach. This beach is popular with monk seals because it’s nicely sheltered and the fishing is good, but if you see them on the beach, just move it along because they absolutely need their rest, AND it is against the law to approach or disturb them. You can see an isolated chunk of limestone submerged in the first photo, and the remainder of the formation at water’s edge in the background. As the old right of way veers inland beyond Donkey Beach, each of the little bays onward to Anahola Beach State Park are only accessible via dedicated dirt roads and recent motocross trails, or at low tide by rock-hopping along the shore. The next photos show isolated hunks of the bar overlain with younger volcanic debris or thrust up along the shore nearer to Anahola. While this formation certainly is not all there is to see between Nukoli‘i Beach and Anahola Beach, it’s been more of a companion. Running, hiking, and rock-hopping Kauai‘i’s eastern shore is never boring. How interesting and lovely! I haven’t been to Kauai yet so appreciate this tour. Thank you. As I mentioned, there is so much more to see than a sandbar. Great post. Was not aware of this feature. Hi Vivian, and thank you! Yes it practically escapes notice. When I first saw it at Baby Beach, I thought it was some public works project gone terribly awry. Then Laura heard from someone that it was a naturally occurring feature, and that’s when I began to notice it everywhere. Great pictures as always! I always enjoy these. Thanks for sharing! A real late bloomer . . .
Today is Election Day in Japan. We’ve been bombarded with nonstop election announcements via loudspeaker for the past couple of weeks, but today it’s peacefully quiet once again. Happy, happy 69th birthday to the love of my life, and my best friend and travel partner!